Had a photo walk with Mike and Emily yesterday and as always, had a great time! One of the stops was at Cap Sante Park in Anacortes and this bad boy was flying around near the bottom of a cliff. Really wish the foliage was out of the way but, after looking the image over and over I feel it somewhat adds a nice little something! A great way to fly.. Mode and Mood spot on, great framing work! I like it. It holds my intrest. 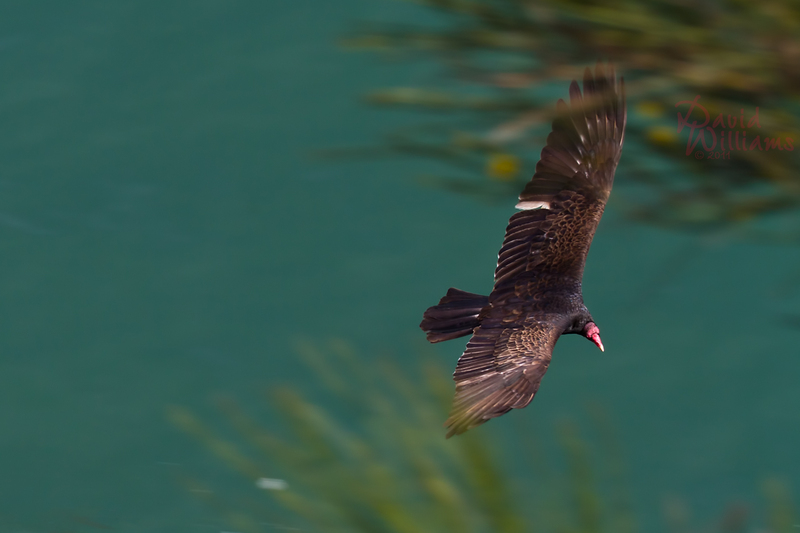 Turkey Vultures are nasty looking birds, but this is an interesting photo! It’s interesting…this photo almost looks like a reflection of a bird than an actual live shot. I’m glad you got one, though! Yay! Due to the foliage? I can see it. Thank you for the comment. Great capture David! I too like the foliage, I think it adds to the image. The foliage does add a certain motion feel doesn’t it? Thank you for the comment Jim. I like the foliage effect. It’s quite amazing actually. Lovely shot of the vulture in flight. I like the aqua background and DOF on the foliage. Thank you Sasi, to be honest, I was rather surprised to see him! Thank you Emily for the wonderful comment!